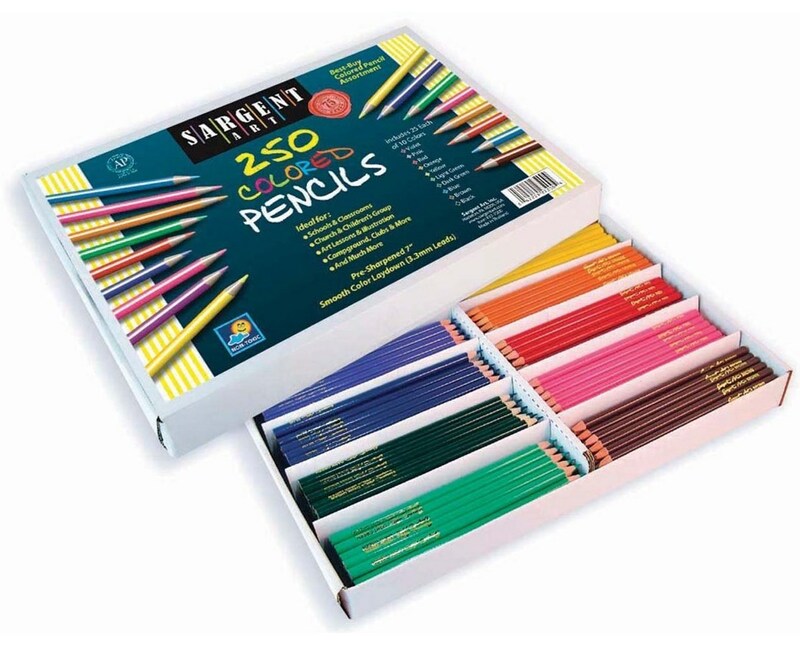 The Sargent Art Colored Pencil Set offers a wide variety of color variations to accommodate most drawing and coloring needs. It is available in 12-color, 24-color, and 36-color sets. For school and classroom use, it is also sold in a 250-piece set. Each colored pencil is seven inches in length and features a 3.3-millimeter diameter lead that is strong enough to resist breakage. 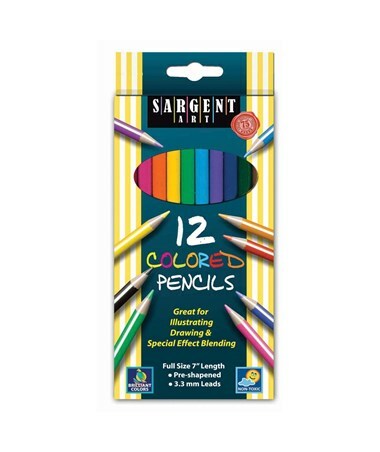 The Sargent Art Colored Pencil Set provides smooth color laydown making it ideal for drawing, illustrating, special effects blending, and other artistic techniques. All colored pencils are pre-sharpened and readily usable. 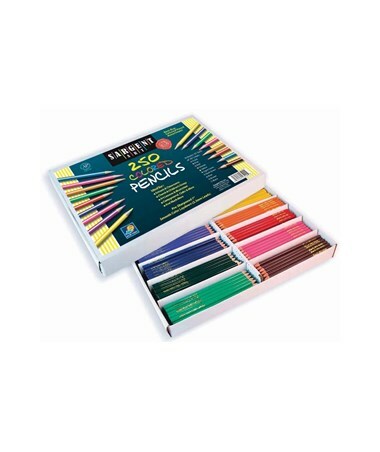 In compliance with ASTM D-4236 standards, these colored pencils are non-toxic and are safe to use. 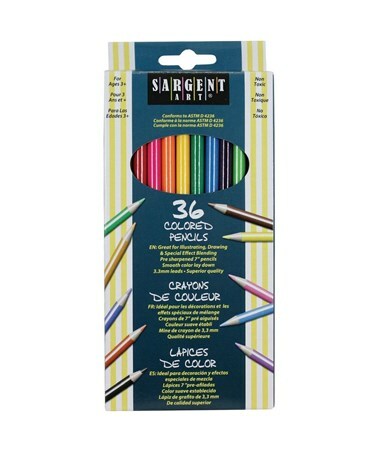 The Sargent Art Colored Pencil Set comes in four different package options. Please select your preference from the menu above. 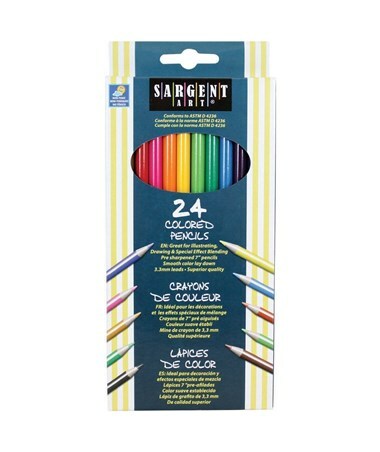 This package includes: Orange, Brown, Blue, Violet, Black, Yellow, Light Green, Dark Green, Dark Red, Rose Pink, White, and Light Blue colored pencils. This package includes: Orange, Brown, Blue, Violet, Red Violet, Black, Yellow, Light Green, Dark Green, Dark Red, Rose Pink, White, Light Blue, Pink, Grey, Light Orange, Vermillion, Chrome Yellow, Light Magenta, Leaf Green, Peach, Tan, Gold, and Silver colored pencils. This package includes: White, Light Yellow, Lemon Yellow, Yellow, Golden Yellow, Tan, Peach, Yellow Orange, Orange, Salmon, Burnt Orange, Red-Orange, Mahogany, Red, Rose, Pink, Magenta, Red Violet, Light Violet, Violet, Dark Blue, Blue, Light Blue, Sea Green, Yellow-Green, Leaf Green, Light Green, Aqua Green, Dark Green, Gray, Silver, Gold, Burnt Sienna, Brown, Dark Brown, and Black colored pencils. This package includes: 25 each of Black, Blue, Brown, Dark Green, Light Green, Orange, Pink, Red, Violet, and Yellow colored pencils.